Not all dogs play fetch. Some of them prefer water sports! Dogs of all breeds and ages benefits from exercise. 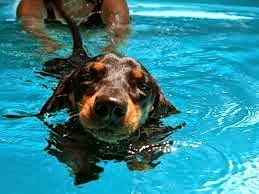 Swimming is a perfect way to keep your dog healthy, because it helps them burn excess energy, hence preventing them from eating everything they lay their eyes on, becoming overweight, or suffering from anxiety. It also provides pain-relief for older or arthritic pooches. Have you ever seen anything cuter than dogs playing with water? Click on the video below of pets enjoying themselves and watch yourself fall in love with each and every one of these funny animals.